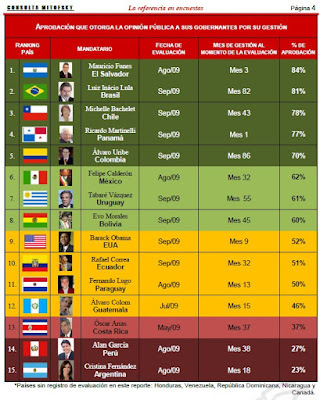 A collection of polling results assembled by the Mitofsky polling firm from countries in the Americas puts Mauricio Funes at the top when it comes to approval ratings. Funes scored an approval rating of 84% among the citizens of El Salvador, the highest of the 15 countries surveyed. Next highest was Lula of Brazil with an 81% approval rating. Barrack Obama was in the bottom half with an approval rating of 52%. The opinion polls were taken during August and September 2009. Not included were Venezuela, Dominican Republic, Canada and Nicaragua. Nor was Honduras, in the midst of a military coup and power struggle, included. In general, asylum can be granted when someone has a well-founded fear of persecution for one of five reasons: race, religion, nationality, political opinion or membership in a social group. The last category has been tried in gang cases, but the appeals board said those resisting gang pressure do not make up a social group. [Lawyer] Chowdhury knew he had to thread the needle. Santos faced peril in El Salvador, the lawyer reasoned, not because he'd resisted the gang, but for a very basic reason: "Because he was his brother's brother." And a nuclear family has long been an accepted social group for asylum cases. Among the clearest points of agreement was that Salvadoran Americans should insist that any legalization plan adopted by Congress allow about 200,000 Salvadoran illegal immigrants who were granted temporary legal status in the wake of a 2001 earthquake to be the first in line to become permanent legal residents. Earlier this week, a new attorney general was finally sworn in for El Salvador. Romeo Barahona took the post after an agreement on his election was finally reached in the National Assembly. The position had been empty for 5 months since the prior Attorney General, Félix Garrid Safie, left office. Election of an Attorney General requires a super majority in the National Assembly, so no candidate could get the post without the support of both ARENA and the FMLN. It took 5 months of negotiations before the two largest political parties finally agreed on Barahona. The new Attorney General takes office at a difficult time. Corruption is high, murders go unsolved, and impunity is rampant. It's going to take more than a new person at the helm to change the institutions which make up El Salvador's legal system. On Wednesday, El Salvador's president Mauricio Funes addressed the General Assembly of the United Nations. The blog at Voices on the Border has a summary of the speech as well as a link to the full text in Spanish. The speech addressed El Salvador's accomplishments since Funes' inauguration and called for unity among various sectors and in the region. I'll let others interpret this information. A ranking of the cost of living in various cities around the world ranks San Salvador 242 out of 276 world cities for the cost of living. The survey indexes the cost of living for a typical expatriate from the US, with the index set so the cost of living in New York City = 100. In the index, the most expensive city was Tokyo with an index of 126.03 and the least expensive was Harare, Zimbabwe with an index of 17.12. San Salvador had a figure of 63.34, or 37% less than New York. San Salvador has a new campaign to promote a famous cemetery as a tourism site. The cemetery "Los Ilustres" is the burial place of many prominent historical and cultural figures from El Salvador's past. The cemetery is filled with ornate and often grandiose tombs of famous Salvadorans and is located in the historic center of San Salvador. A recent press release from the Tourism Ministry described the promotion of the cemetery including nighttime tours of the tombs in a form of "necro-tourism." You can do your own tour of the cemetery online. There is a multimedia presentation from EL Faro is here. Photographer Rene Aquiluz has a collection of photos from the cemetery here. Another photo gallery can be found at this link. You can also take a guided tour at the online forum Skyscraper City here. A story of corruption, drug-trafficking, bribery, international relations, murder and suicide is unfolding in El Salvador and the United States. Carlos Roberto Silva Pereira was a fugitive from justice in El Salvador when he was arrested in southern California in October 2007. He had fled El Salvador where he faces corruption and money-laundering charges. Silva has been held by US authorities since that time and has not yet been extradited back to El Salvador. He has also allegedly been linked by Guatemalan authorities to the murder of three Salvadoran deputies to the Central American Parliament and their driver in February 2007. 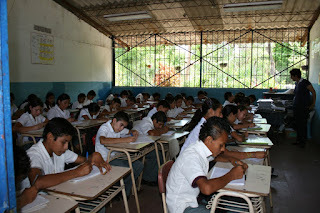 For many Salvadoran families, although the government provides a free public education, the cost of schooling still keeps kids from class. This is so because schools require that students have school uniforms, shoes and school supplies. There may be additional cost if a student needs transportation to get to school. SAN SALVADOR — Four suspects, including a policeman, have been arrested over Franco-Spanish journalist Christian Poveda's murder in El Salvador, police said, indicating the killing was ordered by a jailed gang member. "After an investigation, four people have been detained for involvement in the murder of Mr Poveda," assistant police director Mauricio Ramirez said. Police described the four as a policeman and three members of Mara 18, the violent gang which Poveda meticulously chronicled for his 2008 film "La Vida Loca," about the heavily-tattooed gangsters who engaged in drug trafficking and extortion. The film had already been released but was set for a wider European distribution on September 30. September 7 is the eve of the feast day of the Virgin Mary's birth, and in Ahuachapan in western El Salvador, it is the Festival of the Lanterns (farolitos). The streets and public places of the city are filled with lanterns and memorials to the Virgin. Over the years the festival has grown beyond its religious roots and now includes showcases of artisan works and many food offerings. A video taken yesterday and one taken last year show the lanterns lighting up the city and the celebration in the night streets. Monday, August 31, was the annual Day of the Fireballs in Nejapa, El Salvador. It is part of an annual tradition in the town of Nejapa, where men from opposing teams hurl flaming fuel-soaked rags at each other. The tradition dates back to 1917 when the villagers of Nejapa escaped unharmed from a volcanic eruption, and as a result, thanked their patron Saint Geronimo who, legend has it, fought the devil with fireballs. The BBC has a video here. President Mauricio Funes said he was "dismayed" by the photographer and journalist's killing, which he "strongly condemned." The Central American leader called on authorities to "conduct all necessary investigations so that those responsible are brought to justice". He called on the country to unite to "combat together" the scourge of violence hitting El Salvador. Poveda, police say, was on his way back from filming in gang-controlled La Campanera, a poor suburb north of San Salvador. Poveda's most recent work was the documentary La Vida Loca, an unflinching portrait of youths caught up in El Salvador's gang culture. Movie trailer for La Vida Loca. Gallery of images of Poveda. A man suspected of being a drug trafficker and informant for the U.S. Drug Enforcement Administration and two men accompanying him were gunned down by unidentified individuals, El Salvador’s National Civilian Police, or PNC, said Sunday. Edwin Reynaldo Argueta was pulled out of a local nightspot where he and four friends – two of whom were also murdered – were enjoying themselves, a PNC spokesman said. All the victims had gunshot wounds, the police spokesman said, adding that the other two men who had been with Argueta survived the attack. The spokesman said that the case had been handed over to the Homicide Investigation Division.